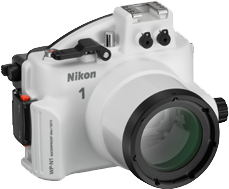 Nikon today announced some great new products in their Nikon 1 compact system camera line-up: a new J2 camera, a new 11-27.5mm lens as well as an all new waterproof housing to take your Nikon 1 J1 or the new J2 underwater. Up to 135 points hybrid Auto Focus system, currently providing the fastest AF available with the most hybrid points (73). More information on the Nikon website. 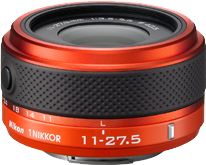 Compared to the 1 NIKKOR VR 10-30mm f/3.5-5.6, it is ±32 g (±28%) lighter and ±11 mm (±26%) shorter. the J2 is a very similar camera to the J1. It's a very minor update that some may consider rather conservative. And, as far as we're concerned, that new lens just has too many drawbacks to be justified. The J2 is indeed only a minor update to the J1 (as far as I could tell, only the LCD is better and full lens on/off is now supported), in that sense a bit disappointing. If size and weight matters, the new lens may have some benefits to the 10-30 (albeit giving up some zoom range). The waterproof case sounds quite nice though!